Mix 3/4 cup sugar, the cornstarch and cinnamon in 2-quart saucepan. Stir in plums and lemon juice. Cook, stirring constantly, until mixture thickens and boils. Boil and stir 1 minute. 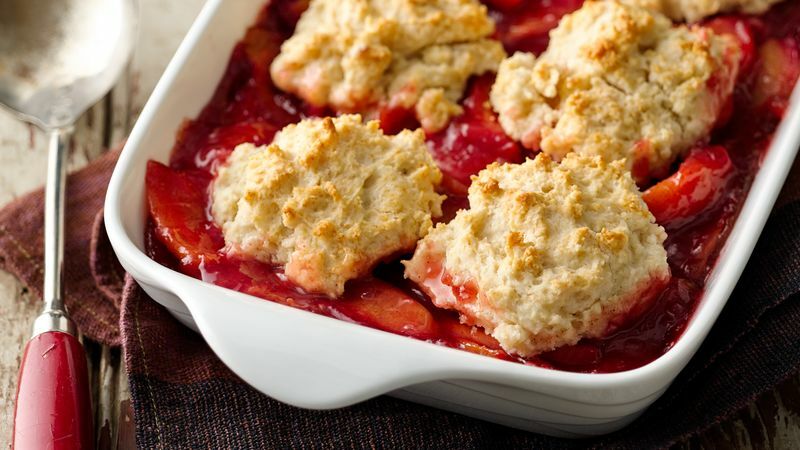 Pour into ungreased 2-quart casserole; keep plum mixture hot in oven. Cut shortening into flour, 1 tablespoon sugar, the baking powder and salt in medium bowl, using pastry blender or crisscrossing 2 knives, until particles are size of fine crumbs. Mix in milk until mixture forms soft dough. Drop by 6 spoonfuls onto hot plum mixture. Bake 25 to 30 minutes or until topping is golden brown. Serve warm with whipping cream. Most grocery stores sell purplish-blue plums, but did you know that plums also come in yellow, green and red? Keep things simple by mixing the cobbler dough in the food processor. Use the plastic blade, and pulse dough just until combined for the most tender biscuits.